Moving home is a time-consuming, stressful and unsettling experience. But it brings the excitement and promise of a new place to live. I’ve just resettled after eight years in the same west London flat. I had to go through the final ritual of handing over the keys and signing it over for good. Letting myself in early, I took some shots and wallowed in the sadness that an empty – and recently vacated – property always has. There was occasional sunlight thrown on the now bare walls. The main shot focuses on the place I sat to edit photos and write posts. 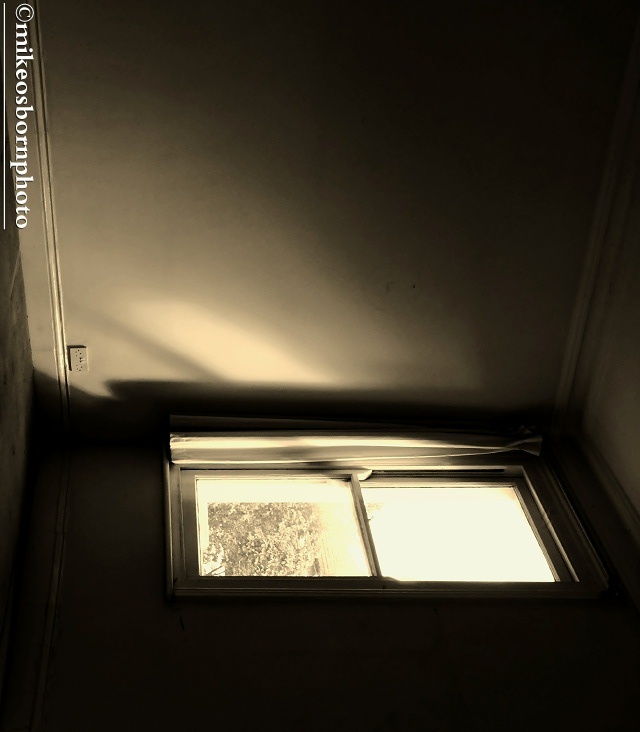 The others include the only two interior shots I have from my life there – a memorable old bathroom window that diffused and projected light. But that was then. The new pastures are being happily settled while the photography continues. I love these pictures Mike and I know totally that feeling you describe: “the sadness that an empty – and recently vacated – property always has.” When I walked around the empty house we lived when both my kids were born; just before handing over the keys was a very sad feeling. You have definitely captured the mood and feeling perfectly with these photos. They’re excellent! Thanks Peter, this is much appreciated. It felt like the closing of a chapter since another one has opened, which is far more exciting. It really is hard to resist an empty room or building, especially if you have a connection with it. Have a great time in your new place! I hope it soon will be your HOME. Thanks so much :-) Yes, it’s really getting there already. It might spark new photographic ideas! And on another note congratulations to the Netherlands for making the Eurovision final – very well deserved. I’m looking forward to the photos of your new home and the environment of your place! Your sense of space is definitely ‘your thing’. Very much enjoy seeing your work. Thank you very much, Rufus. I’m a little neurotic about it, but that’s another story! Great shots! As Peter said, you’ve captured the mood perfectly – I can picture myself taking one last look around. Much appreciated, Noeline. Of course it cried out for monochrome, though the abandoned sets of keys are an added splash of vibrancy. You captured a sense of nostalgia with these images, Mike. That bathroom window effect is beautiful. Thank you Lena, I’m glad you like them. Yes, that bathroom window was a nice feature when the sunlight fell in a certain way. Thank you Andy. Glad to say it’s soon replaced with the excitement and joy of somewhere new. And I hope you had success with your exhibition. Really well captured Mike in that these images capture the visual essence of your emotions and words. I wish all the best in your new pad and that the view “is over the roof tops”. Have a great weekend ! Thanks so much, James, that’s much appreciated and the aim of all of this! Settling in well and I hope to bring a flavour of the new neighbourhood soon. Enjoy your weekend too and I hope it involves some camera work.